Free Agent John Terry To Solve United's Defensive Crisis? Free Agent John Terry To Solve United’s Defensive Crisis? Jose Mourinho has a couple of weeks before he gets his players back after the international break, and this gives him time to think about the problems and their possible solutions. The Manchester United boss has been under severe criticism this season, and with his team looking far away from being a title winning one, it might be time to change things around. Getting a center-back in the summer was the one wish that the boss did not see get fulfilled, and that seems to be haunting his plans for the campaign. The Red Devils have already lost 2 of their 4 games so far, and a weak defense can be easily pointed towards to direct the blame. However, there are a few who believe that it is not too late to get some reinforcements at Old Trafford, and a surprising name has sprung up to become a part of the rumours. Adrian Durham from talkSport has claimed that a certain John Terry would be the perfect man for Mourinho this season. When asked to talk about his shocking claim, Durham said: “All they can go with is free agents and John Terry is exactly that. John Terry would get into the Manchester United team ahead of Smalling, Jones, Rojo. While the statements might be bold, a majority would still end up agreeing with this claim. 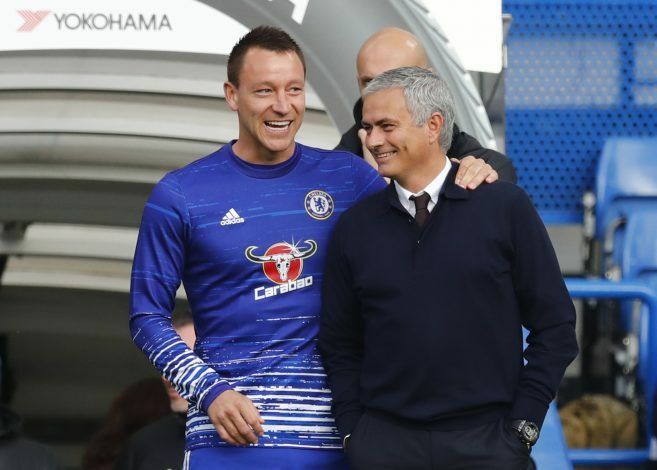 Given his Premier League winning experience, his relationship with Jose, and his knowledge of the game, is Terry about to become the most unexpected free agent signing of the season?